I think I am now officially hooked to cereal...seriously. Several months ago, I opted to be a member of MyBlogSpark and during the holidays, I was very pleased to have received several coupons in the mail. General Mills sent coupons via MyBlogSpark that entitle me to purchase any of their cereal products not exceeding $6 per individual purchase. This made me quite excited since I've always been a fan of General Mills cereals such as Cheerios, Honey Kix, and Nature Valley, to name a few. So when I headed out to the supermarket, I was all geared up to try out something new that the whole family would enjoy, especially Noah. 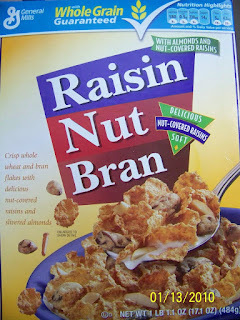 For my very first purchase using one of the coupons, I opted to grab Raisin Nut Bran. I was hoping to find something high-fiber but not cardboard tasting and since on the box it says "with almonds and nut-covered raisins", I thought it would be interesting, to say the least. when I saw how much Noah loved it! It's usually difficult to get him to eat cereals since he doesn't enjoy the bland tasting ones, but at the same time, I don't want to feed him the all-sugar varieties that are actually more junk than real food. Well, this one is really delicious! 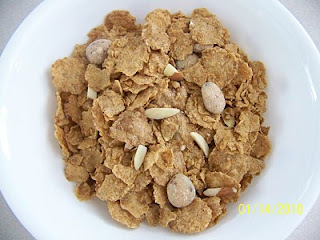 He really enjoyed the crunch of the almond pieces that are not just 'token' almonds in the cereal.I think they are sufficiently distributed all throughout and the raisins lend sweetness and further textural interest in every bite. I must admit though, that if you're looking for an extremely 'healthy' cereal, this would probably not fall within that category only because the total carbohydrate-to-sugar ratio is not the most ideal. Yes, it does have 5grams of fiber and it's all whole grain, which is great! However, as I've read, the most ideal thing would be to have no less than a 4:1 carbohydrate to sugar ratio (e.g. if there are 24g of carbohydrates per serving, the sugar should only be as much as 6g per serving), and this product does not have that desired ratio. If you are watching your carbohydrate and/or sugar intake pretty strictly, this may not be the best cereal for you. Overall, suffice it to say that I absolutely love/d its taste and will most likely purchase another box. I really enjoyed this one and I think it's pretty cool that, as I enjoy my bowl in the mornings (and afternoons and evenings! ), Noah insists on sharing it with me as well!